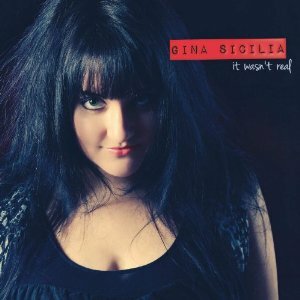 Not yet 30 years old, Gina Sicilia has already been nominated for a Blues Music Award. She has received excellent notices for the three CDs she has recorded with multi-instrumentalist and producer Dave Gross, on which the Pennsylvania singer has explored various shades of American music, with a focus on blues and soul. Her just-released fourth album shows Sicilia to be a mature artist who is determined to push in interesting directions. It Wasn’t Real marks Sicilia’s first venture recording outside of Gross’s Fat Rabbit Studios. This time, she works with Grammy-winning producer Glenn Barratt and a group of session aces from the Philadelphia area. Erik Johnson on drums, and Scot Hornick, whose fat-toned acoustic and electric bass style lends a tuba-like bottom end to the songs, form the ear-catching rhythm section on all tracks. Key contributors to the instrumental textures include Jay Davidson (saxophones), Joel Bryant (piano, Hammond and Wurlitzer organs, Fender Rhodes), and Kevin Hanson, Ross Bellenoit, and Jef Lee Johnson (guitars). In a what might be considered a daring move on Sicilia’s part, there’s not a 12-bar progression to be heard among the nine songs she wrote for It Wasn’t Real, and only the disc’s lone cover, the sultry, swaggering “Don’t Cry Baby,” from the catalog of Etta James, qualifies as pure, tough R&B. Piano and tenor sax work hard in this deceptively quiet arrangement, but not as hard as Sicilia, who expresses a spectrum of intensity, here caressing a line, there blistering one. The singer of the poignant “Don’t Wanna Be No Mother” looks back on her dreams, realizing too late that life has delivered her elsewhere and made them impossible. A hall-of-mirrors story of betrayal and love that illustrates the inscrutability of chance, “Walkin’ Along The Avenue,” a jazzy strut in a minor key, takes on a continental patina through Dennis Gruenling’s exotic, Gallic harmonica lines. The title track, a tale of deception and heartbreak, is no less affecting for the relative simplicity of its storyline: set to a moody, noirish grind that evokes wet pavement and deep shadows, it lays bare the narrator’s anguish via snapshots from the doomed relationship. Other, brighter tonalities provide relief. The music behind “Wake Up Next To You” underscores the dreamy lyric with touches of reggae, a hint of the Band in the chord changes, and a melodic guitar break. “City By The Water” is a light R&B ballad, stocked with warm, nostalgic images. “Please Don’t Stop” combines a second-line feel straight out of New Orleans with an irresistible vocal line. A brilliant arrangement, highlighted by Sicilia and Barratt’s backing vocals, Bryant’s keys, and Mike Brenner’s out-of-left-field lap steel, makes “Oh Me, Oh My” a pure pop success that recalls “Dream A Little Dream Of Me” or the Lovin’ Spoonful’s “What A Day For A Daydream.” “Walkin’ Shoes,” a perky country shuffle marked by tic-tac bass and dueling electric guitars, is worlds better than the pap oozing out of Nashville these days. Sicilia splits the difference in styles on the laid back “Write A Little Song With You,” genre-perfect country soul with a lovely pop sheen–a truly standout track. With great emotional and dynamic range, and a wonderfully smoky voice, Gina Sicilia is a premier singer. Her accomplished songwriting–lyrical, narrative, and introspective by turns–continues to evolve. It Wasn’t Real, its country and pop inflections, bluesy soundscapes, and slow-burn ballads all unified by creative arrangements and soulful vocals, will hold strong appeal for fans of American music.